Aqua Mira is a water treatment drop used to purify drinking water by hikers and campers. 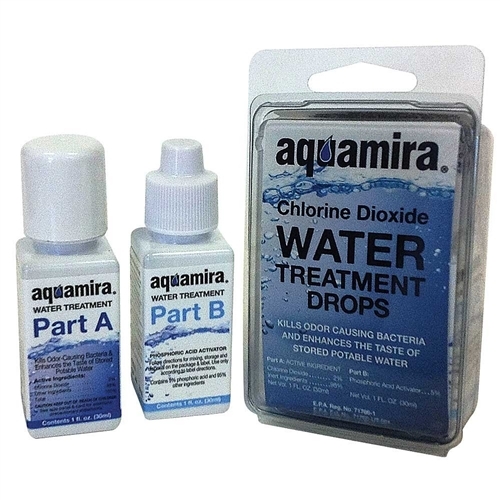 The chemical properties of Aqua Mira, which is made of a chlorine dioxide formula, is capable of killing virus, bacteria, and cysts such as cryptosporidium and giardia. These are some of the more likely bad results of drinking untreated or unfiltered water for hikers. By adding equal parts of two different chemicals together and allowing them to activate for 5 minutes, a hiker can have clean and safe drinking water after mixing the Aqua Mira with water and waiting 30 minutes. Simply add seven drops from each bottle in the mixing cap for each liter you want to treat. Easy as pie! 1. Prior to Treatment, clean and disinfect the water storage container and lid. 2. Place 8 drops Aquamira® Water Treatment (Part A) and 8 drops of Phosphoric Acid Activator (Part B) in mixing cap to pre-mix. 3. Let mixture react 5 minutes to ensure full activation. 4. Fill container with 1 quart (1 liter) water. Add contents of mixing cap. 5. Shake or stir and let stand for 15 more minutes. If water is very cold or turbid, let stand for 30 minutes. 6. Water is now ready for use.